Build a good foundation of the basics, both sections in the exam have questions that are concept driven. Hence, it is essential that you revise and strengthen your basics. Prepare the concepts well, revise them regularly and practice a lot of questions for each concept. Work well on advanced Mathematics, the Quantitative Aptitude section comprises 60% of the paper. The questions are a mix bag from various areas and the difficulty level is between moderate to difficult. Hence, to achieve a good overall score, it is essential that you score well in this section. 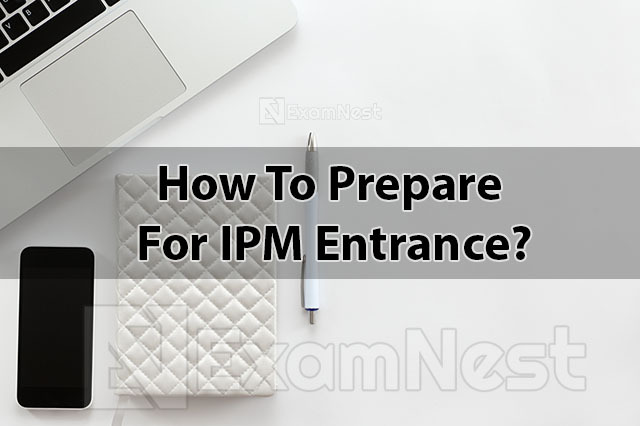 The IPM Aptitude Test checks you on subject knowledge and your ability to manage time without compromising on accuracy. And as it is an online test, it is essential that you practice several mock tests. This will condition you to the actual test taking conditions and help you score well. Analyse your strengths & weaknesses, After the mock test; it is strongly advised that you do a thorough analysis of the test. Recognize your strong and weak areas and work on them accordingly. Revise your strong topics regularly and devote extra time and effort to improve the weak ones. Also appear for topic based and sectional tests which aid you in this. Practise well, It’s about how quickly and accurately you solve a certain question rationally. At the end of the day, practice does make a man perfect. Live by this rule when preparing for this IPMAT. Choose with care, as the difficulty level of this exam is not easy, it is not possible to attempt all the questions within the given time. Hence, choose the questions you want to attempt wisely. Knowing your areas of strength and weakness here is of great importance. For instance, if you are good at algebra, recognize and attempt all questions of algebra first. This will give you a head start in terms of time and also build up your confidence for the rest of the questions. One should take calculated risk, the sectional time and negative marking make the choice of questions very important. Do not make wild guesses, be very careful with the Verbal ability section as students often tend to make mistakes with the choices. With Quantitative Aptitude it is a little easier to apply this even if you are not aware of the concept, but be careful, at times you might not reach a particular solution. Don’t waste time, remember that the clock is ticking and you have less time. Sometimes you might get stuck on a question from an area you are good at. If you are unable to crack any question, don’t waste time on it. Move on to the next question and come back to it later if time allows. You don’t want to miss out on an easier question that could have fetched you equal marks.